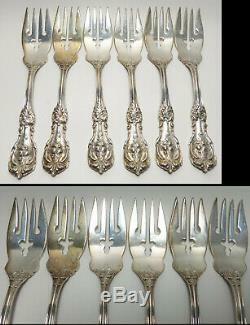 Reed & Barton sterling silver silverware set is in the ornate Francis I pattern. And comes with some nice serving pieces. None of the pieces are monogrammed. Included in the set are. 6 Dinner Forks 7 ¼ long. 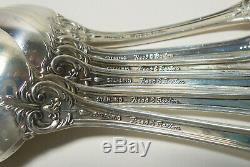 6 Salad Forks 6 ¼ long. 6 Soup Spoons 6 ¾ long. 6 Dinner Knives 8 ¾ long. 6 Luncheon Knives/ Spreaders 6 ½ long. 2 Big Serving Spoons 8 ¼ long. 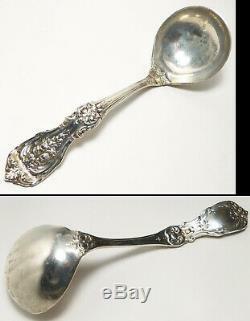 2 Big Slotted Serving Spoons 8 ¼ long. 1 Big Serving Fork 8 long. 1 Pie Server 10 ¼ long. 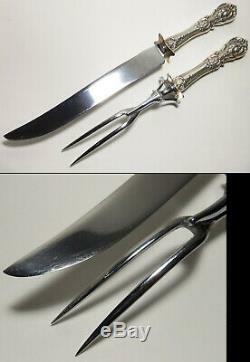 1 Two-Piece Carving Set: The knife is 13.5 long and the fork is 11 long. Every piece is marked as pictured Reed & Barton sterling. Nice pre owned condition with light wear but some tarnish as pictured. No monograms and no dents. Because of image limitations I cannot picture every surface in close-up but the representative pieces honestly show the general condition of the rest. I have tried to capture the condition as honestly as possible in the 12 images so please be sure to see them all. Zoom in for the best views. The Unpaid Item Assistant is set for 4 days- If you need more time to pay please let me know. Just wait for a few minutes after winning to allow me time to send a combined invoice. As always, my merchandise is guaranteed authentic and in the condition described. 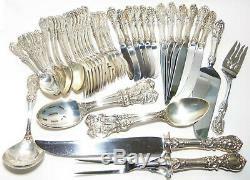 The item "Reed & Barton FRANCIS I Sterling Silver Silverware Set 45 PIECES! No Monograms" is in sale since Sunday, April 7, 2019. This item is in the category "Antiques\Silver\Sterling Silver (. The seller is "bennett_antiques" and is located in California . This item can be shipped to United States, Canada, United Kingdom, Denmark, Romania, Slovakia, Bulgaria, Czech republic, Finland, Hungary, Latvia, Lithuania, Malta, Estonia, Australia, Greece, Portugal, Cyprus, Slovenia, Japan, China, Sweden, South Korea, Belgium, France, Ireland, Netherlands, Poland, Spain, Italy, Germany, Austria, Mexico, New Zealand, Switzerland, Norway, Ukraine, Croatia, Bermuda, Iceland, Sri lanka, Monaco.